I picked up Call of Duty Black Ops 3 when the disc version went on sale on Amazon and there wasn’t a Logitech G13 profile for it. I created one and it worked well for the single player missions. I am just starting to test it out in multiplayer. So far it is working, but I haven’t gotten a good kill streak that would let me test if I had the right keys mapped to the analog stick for those. This is similar to what I did with Call of Duty Ghosts (I lost that profile in a reformating of my computer to install Windows 10). 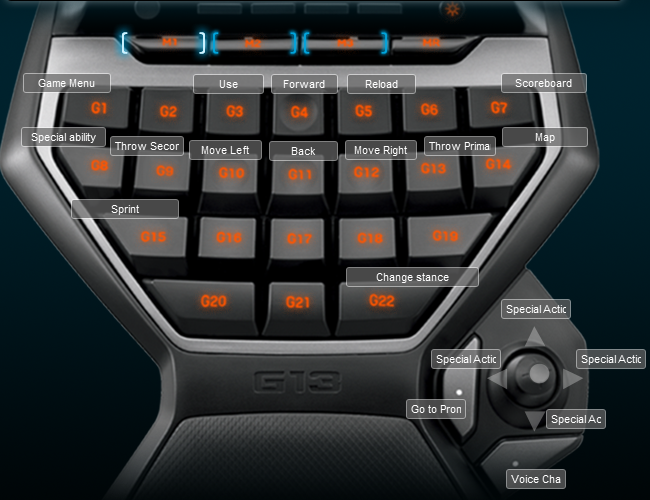 Below is a screen shot of the keyboard layout for the game. I put melee and jump as always on my extra mouse buttons.